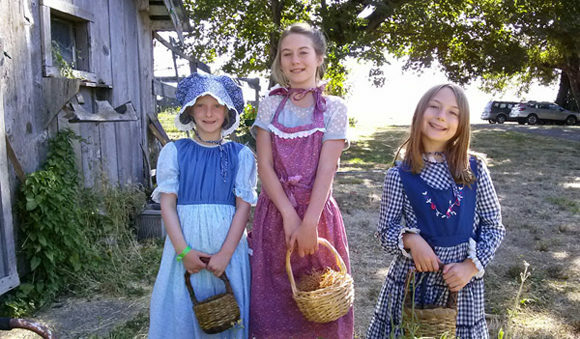 Go back in time and live like an Oregon settler in 1850 at our pioneer education center. The family farm includes a pond, chickens, garden, one-room schoolhouse, and a pioneer “homestead”. We can provide pioneer clothing like bonnets and aprons or you can wear your own. Complete with fun activities, authentic “chores” and crafts. This class will earn you the Playing the Past badge in a truly unique and hands-on way. Activities will include: Sew your own pioneer shoulder bag, play authentic games, hear pioneer stories, learn pioneer phrases and what they mean, iron cotton with our old-fashioned iron, learn to finger knit, and if there is time, learn to square dance! For more information call Karen at 541 968-1986 or email karen@singingcreekcenter.org. Frontier Heritage Fair at Lane Co. FairgroundsGirl Scouts: Play like a Pioneer- Games Galore!